Cash advance loans, also called online payday loans, can you help you cover emergency situations between your paychecks. Working from the privacy of your phone or personal computer, you can quickly and safely apply and, in up to 80% of the cases, be approved for a cash advance loan. 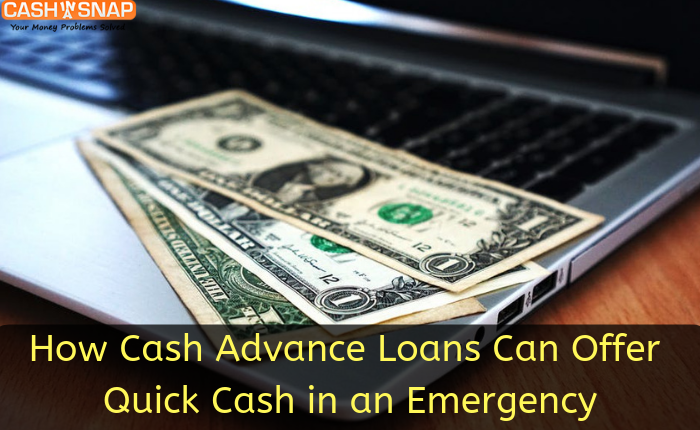 However, let’s first understand what cash advance loans are and how they can help you. Cash advance loans are short-term loans that you can obtain online and are usually repaid on your next pay date or within 2-4 weeks. After taking 2-3 minutes to apply online, if approved, you can have cash in your bank account within 1 business day. The application process is fast, easy, and secure and most states allow some form of online payday loans or cash advance loans. However, check your state’s regulations (usually easy to find on your state government’s website) to be sure you can apply. What Are the Benefits and Advantages of Cash Advance Loans? Getting immediate financial help for whatever emergency you are facing. Unlike any traditional loan, there is no collateral required, no high credit score, and no reams of paperwork to fill out. You also don’t have to wait weeks for an answer to your application. In fact, you usually get an answer in less than 2-3 minutes AFTER applying for online payday loans. Now that’s fast. You also can spend the money in any way you want, although, it is recommended you only use it for emergency situations. If you have poor credit, paying it back as you agreed to, on time, can start you on a path to a better credit score. Can You Get a Cash Advance Loan the Same Day You Apply? Generally, you cannot get cash the same day you apply. Why? Because the money can’t be deposited into your account until the next business day after you have been approved of online payday loans. Most ads that promise same day cash are misleading, but there are ways to get cash the same day. Notably, auto title loans, which are not available in most states, can get you cash on the same day. However, you risk losing your car if you miss a payment which is a BIG risk to take. Are Cash Advance Loans Bad for My Credit Score? Applying for a cash advance loan should not affect your credit score, unlike conventional loans. However, if you are approved for a cash advance loan and then are late on your payback date or miss your payments, it may reflect negatively on your credit score. Lenders do have the ability to report missed or late payments, and most do. Therefore, the sound advice is never to get a cash advance loan unless you are positive you can pay it back on the terms offered to you. Be careful and understand your payment terms completely. CashinaSnap.com provides online cash advance loans that help you through difficult financial times. We have over 100 lenders who want to loan money to qualified applicants. Looking for online payday loans? Kimmy Burgess is the Manager of Cash in a Snap, which helps clients get connected to its large network of reputed lenders to get an instant cash advance online when they need it. Kimmy has over 20+ years’ experience in Administrative Management, with many years in the lending industry.